Seaweeds have their seasons of peak vitality just like plants in the garden. 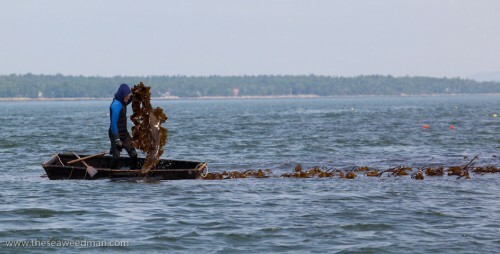 In mid-May, kelp plants (laminaria longicruris and laminaria saccharina) are in their prime. 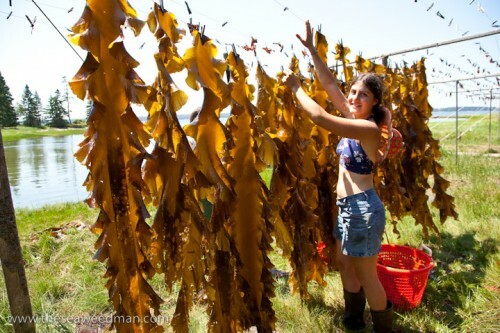 On the land, dry air blows in with high pressure from Canada, and in the afternoon, a southwest sea breeze helps dry the kelp that is hung up on lines at the high water line. 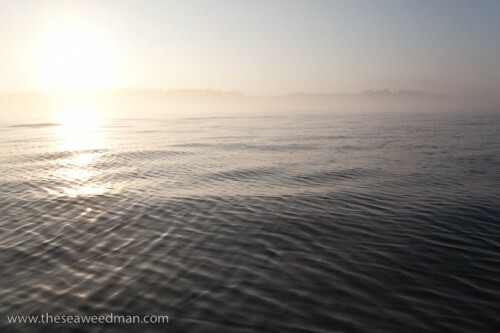 Mornings are flat calm, sometimes there is fog, and we journey to the kelp beds by reading the signs on the water. For instance, sometimes there is a cross-hatch pattern on the water. I call this a “mixing pattern”. 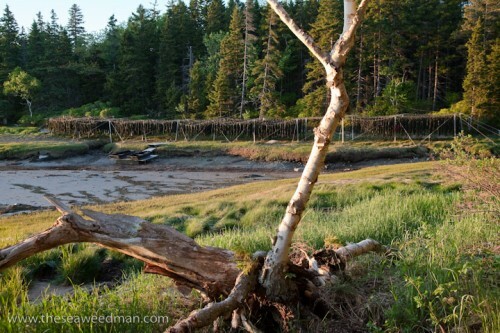 It is created when the incoming tide splits and flows around the islands at the mouth of my bay. When I hear an apprentice exclaim, “Oh! Look! The mixing pattern! I KNOW where we ARE!”—then I know that s/he is beginning to pay attention to reading the signs on the water. The journey to the kelp beds takes about an hour. There’s a two hour window of opportunity to pull kelp into the boats. The goal is to pull 2000 pounds into the boats within two hours. Coming home takes an hour. We all take a mid-morning break, getting out of our wetsuits, taking showers and warming up. Then we have a substantial breakfast. This is the meal that’s going to be with us as we hang up the kelp. The rest of the day is spent in the open air and sunshine, and if you just want a mantra to keep your hands busy while your soul ripens, you’ve come to the right place. We’re going to handle approximately 2000 pieces of kelp, pinning each individual piece of kelp to clotheslines set up on the high water mark in the cove. « The Work Accomplished, We are Relaxed into Perfection.